We were on a walk in the woods…just the two of us. He had just defeated a dead limb with ninja-like skill and transformed it into a walking stick. I smiled and affirmed his feat of great strength. His increasing sense of adventure is matched only by his passion to be with, and be like, his Dad. I love and encourage that endeavor, even though it means I take the back seat for awhile. So I treasure these fleeting moments when he seeks my acknowledgement and approval. In that brief window of opportunity, it dawned on me that strength is not the only thing I see in him. And I want to make sure he knows it. 1. You are strong. Yes, Son, you are strong. You are growing stronger (and taller!) every day. But more than physical height and brawn, I hope you always remember your greatest strength comes from Christ. The day will come when you face challenges greater than sticks and leaves. You’ll face choices that could potentially threaten your innocence and your character. When that time comes, remember that in Christ you are strong. No matter what your friends do, no matter what the world says you should do, be strong. Because your strength comes from Someone greater. Strength is not the only thing I see in my son, and I want to make sure he knows it. 2. You are smart. In a world that insists on “dumbing us down” by feeding us a steady diet of entertainment, ideologies, and philosophies they deem important, I pray you always seek Truth. I hope you love to learn, but not just for knowledge’s sake. Remember where true knowledge and wisdom are found…search out that Truth, and always, always speak up for it. Determine to choose what’s right, even when it’s not popular (and especially then). 3. You have a purpose. God has has given you specific abilities and talents for a reason…there are things He created you to do. It’s OK if you make some mistakes along the way, everyone does. Learn from them, and grow from them. As much as you can, learn from the mistakes others have already made. Run hard after God. Discover what He created you for. Then pursue those things with great passion. Whatever your hand finds to do, do it with all your might (Ecclesiastes 9:10). 5. You are loved. Of course Dad and I love you. Your 6-year-old self never questions that. I pray your 16-year-old self, your 26-year-old self, and all the “selfs” between and beyond never question it either. I pray you also know that God loves you. He loved you before you were born. He loves you when you mess up and when you get it right. Nothing you do can make Him love you any more, or any less, than He already does. In the years to come…when you wrestle with what you believe and struggle to understand all that you’ve been shown and taught…remember this one thing: God, and Dad, and I all love you more than you know. Yes, Son, I see how strong you are, but more than that, I see how strong you will become. 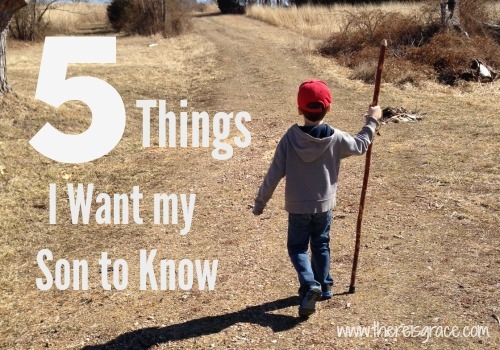 Find out what 5 Things I Want my Daughter to Know. What About that Candace Cameron Bure? So very sweet and so true. I was thinking the other day I had not seen a post from you in a while. Charlotte, you’re so kind to have missed me! 😉 It’s been a little busy around here…hoping to post a little more frequently now. Such a beautiful letter to your son! AMEN! I agree with everything in this, as I raise my boys there are some things that I hope and pray they will always know , and these are on my list. Thank you! It is a beautiful reminder of what is really important as we raise our children. It isn’t about going to the dance competition. It isn’t about winning the spelling bee. It isn’t about wearing the nicest clothes. It is about love, confidence, faith and goodness. Thanks for a beautiful post!